A monthly electronic newsletter summarizing Minnesota's climate conditions and the resulting impact on water resources. 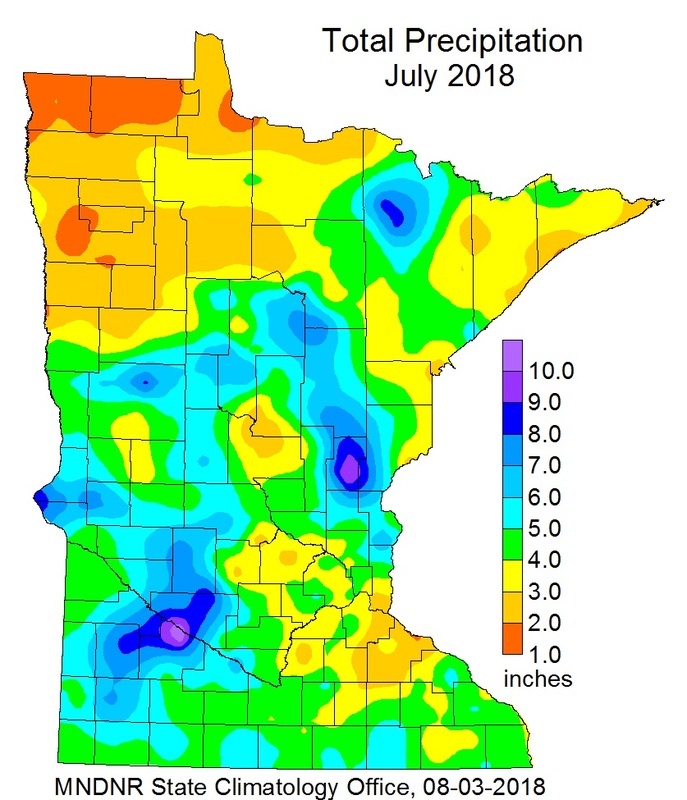 Precipitation totals were mixed across Minnesota for July 2018. Some areas were extremely wet such as the southwest and parts of east central Minnesota, while northwest Minnesota fell short of normal. Two areas that stood out with excessive precipitation totals were Redwood Falls in Redwood County with 12.23 inches (8.71 inches above normal) and 11.03 inches (7.04 inches above normal) at Mora in Kanabec County. On the other end of the spectrum, Crookston in northwest Minnesota had 1.47 inches, or 1.53 inches below normal. The statewide average was 4.33 inches or .42 inches above normal. There were a few storm events of note in Minnesota for July 2018. The main events were two heavy rain episodes on July 3 and July 12-13. Repeated heavy thunderstorms produced flash-flooding in southwestern Minnesota during the morning of July 3, 2018. The largest rainfall amounts fell along and southwest of the Minnesota River, in and around Redwood Falls, Marshall, Tracy, Slayton, and Walnut Grove, where rainfall totals of 3-5 inches were common. The National Weather Service Cooperative Observer at Redwood Falls reported 5.25 inches as of 7 AM. An automated tipping bucket at a stream gaging site near Redwoods Falls unofficially tallied over seven inches. The second heavy rain event of note was during the early morning hours Thursday, July 12. Up to seven inches of rain fell over Kanabec and southern Pine County, causing many roads to be flooded. One of the highest totals found was 7.84 inches in the town of Mora at the Kanabec Soil and Water Conservation District office. Five inches of rain fell over much of Kanabec, into Mille Lacs, southern Aitkin and southern Pine Counties. Mille Lacs Lake rose a half a foot in 24 hours. July 2018 finished a little warmer than normal for Minnesota. The preliminary average statewide temperature for the state was 70.3 degrees, which is .5 (one half of a degree) above normal. The warmest temperature found was 97 degrees at Theilman in Wabasha County on July 13, and the coldest temperature found was 37 degrees at Goodridge in Pennington County on July 27th. The Twin Cities wound up being 1.2 degrees above normal for the month. Five days had a high temperature of 90 degrees or above, bringing the summer total to 13 which matches the annual average. Seasonal precipitation totals (April 1 though July 31) are ranked above the historical median over southern Minnesota and below the historic median in the northwest and far northeast. The northwest and northeast parts of the state have been missed by passing thunderstorms more often and parts of these regions are below the 20th percentile in ranking. A sizeable area of southwest Minnesota is in the 99th percentile ranking, or nearly the wettest on record that period. The U.S. Drought Monitor map, released on August 2, depicts 14 percent of the state in the Abnormally Dry category, mostly in north central Minnesota and a small part of northeast Minnesota. This is a bit of a decrease from the week before. One year ago about 17% percent of the state was in the Moderate Drought category. The U.S. Drought Monitor index is a blend of science and subjectivity where drought categories (Moderate, Severe, etc.) are based on several indicators. The U.S. Geological Survey reports that stream discharge values are generally normal to much above normal in the central and south, with normal to below normal flows in the north. There are some pockets of much below normal flows in the northwest. Water levels on most Minnesota lakes vary depending on lake and location in the state. Mille Lacs was a half foot above the median lake level for early August. On August 6, Minnetonka was at 929.10 with 20cfs flowing through Grays Bay Dam. White Bear Lake was at 923.83 feet on August 6, a rise of .69 feet from one year ago. On July 13, White Bear Lake had a level of 924.05 feet, the highest level seen since June 2005. Rainy Lake was in the median rage for July into early August and Lake of the Woods was below the median range for the same time period. Great Lakes water levels remain above long-term average levels at the beginning of August. In the last month, Lake Superior’s water level increased an inch, with a level of 602.56 feet on August, five inches higher than the monthly average for August. 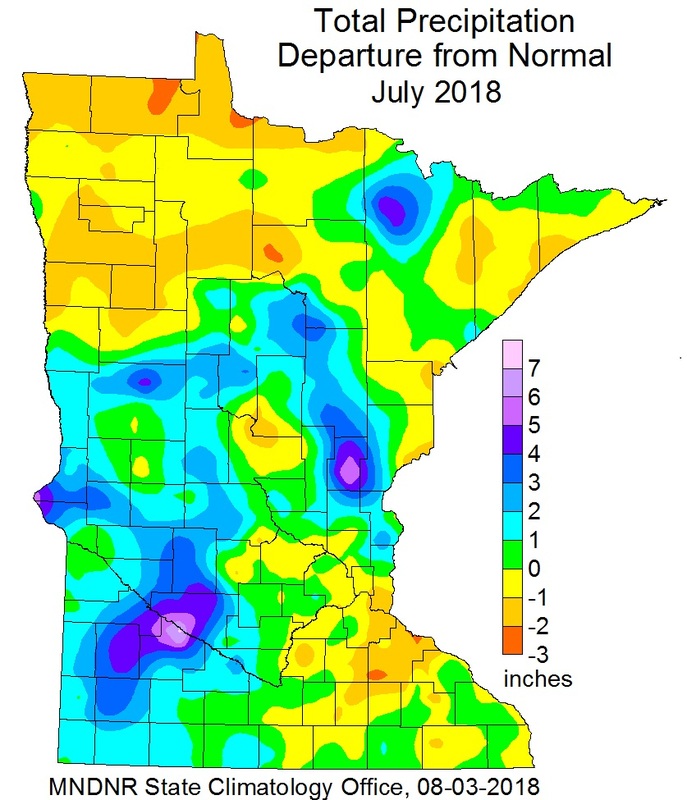 The Agricultural Statistics Service on August 6 reports that topsoil moisture across Minnesota is 4 percent Very Short, 15 percent Short, 72 percent Adequate, and 9 percent Surplus. There is adequate soil moisture at Lamberon and Waseca. The progress of the corn and soybean crop are both ahead of the five year average. On August 6, the potential for wildfires is currently rated by DNR Forestry as Low across central and southern Minnesota, with Moderate potential in parts of northern Minnesota. In northwest sections the fire danger is Very High. Historically, 80 percent of all wildfires in Minnesota occur during April and May. The August precipitation outlook leans towards equal chances for below, above and normal precipitation across the entire state. August precipitation normals range from about two-and-a-half inches in northwest Minnesota to about five inches in southeastern counties. The August temperature outlook leans towards equal chances for below, above and normal temperatures across all of Minnesota. Normal August high temperatures are around 80 degrees to start the month, dropping to the mid-70s by month's end. Normal lows are around 60 degrees early in the month, falling to the mid-50s by late August. The 90-day precipitation outlook for August through October indicates equal chances of below-normal, near-normal, or above-normal conditions across Minnesota. The August through October temperature projection also has equal chances of below-normal, near-normal, or above-normal conditions across Minnesota. However, most of the country has a projection of a tilt to above normal temperatures. It has been a quiet severe storm season across Minnesota. A quick look by the National Weather Service estimated that there were only 6-8 weak tornadoes through the end of the 3rd week of July in 2018, typically by late July the count would be in the 20-25 range. The last time there was a quiet year similar to this one was 2013, when there were only 15 tornadoes for the entire year in Minnesota. So far, there has also been a lower count of severe thunderstorm warnings as well. The Chanhassen National Weather Service noted 40% less issued severe thunderstorm warnings, about 102 though late July compared to 180 in 2016 and 173 by late July in 2017. It has also been a quiet severe storm season across the country. Nation-wide preliminary counts of tornadoes so far this year are well below historical averages, and closely match the quiet tornado season of 2013.